While some businesses may be making cutbacks because of the recession, Wisconsin's private campground owners have been spending money to make their properties more attractive to prospective customers this year. They've invested hundreds of thousands of dollars to improve their facilities even without the benefit of federal stimulus dollars. The owners expect to cash in as families scale back their Disney World plans this summer in favor of less-expensive weekend camping trips. Reservations are up this year for the 16-week season that began on Memorial Day weekend, according to two Wisconsin campground owners. "Camping, even in stressful times, can be the outdoor activity of choice,"said Bud Styer, who operates five Wisconsin campgrounds. "People with families especially are still going to recreate and they're going to do something with their kids." Styer said he is spending $565,000 this year at his five campgrounds and expects to recoup that investment in three to five years through camping fees. He's spent money on things such as a Jumping Pillow for Baraboo Hills Campground north of Baraboo, blacktop for a circle around the pond at Merry Mac's Campground near Merrimac and a remodeled camp store at River Bend Campground, which he manages but doesn't own, west of Watertown. River Bend, which features a 300-foot water slide, was closed last summer because of extensive flooding when the Crawfish River overflowed its banks. It didn't reopen until August. Styer said the campground had to be cleaned before improvements were made. He also has upgraded Smokey Hollow Campground near Lodi and Tilleda Falls Campground west of Shawano. Water-related features such as Water Wars -- a competition with water balloons -- or floating water slides and climbing walls are popular improvements at many parks. "Years ago, we camped in a Coleman tent with a kerosene lantern," Styer said. "Nowadays, everybody's got to have electric, water, box fans and rope lights." Styer said he's a great believer in "stuff" and that the more stuff you have, the more you can charge for campsites. A private Wisconsin campground with amenities can charge $39 to $50 a night, he said, compared to $25 to $35 a night for a standard campground. "If you want to expand your business and generate additional revenues, then you have to have a better facility,"he said. "It has to have the bells and whistles. People are going to camp closer to home and look for the best value." Upgrading campground facilities this year is a national trend, said Linda Pfofaizer, president of the National Association of RV Parks and Campgrounds in Larkspur, Colo. The association represents 8,000 private campground owners. "The recession is temporary," she said. "Most campground and RV park operators believe that it behooves them to move forward with their improvement plans to remain competitive with other travel and tourism options." Gary Doudna, owner of Buffalo Lake Camping Resort near Montello, said he's added two park models and rebuilt playground equipment. "We try to keep adding what the customers are asking for," he said. "A few years ago, during a downturn, there were many people who didn't travel West or take a large vacation, and we're seeing that again." At Fox Hill RV Park south of Wisconsin Dells near Ho Chunk Casino, roads have been repaved with recycled asphalt, the pool was retiled, the bath house was remodeled and a disc golf course was added, said owner Jim Tracy. He said the overall construction slowdown helped him negotiate a good deal on the bath house remodeling. "I'm still pretty bullish on the summer," Tracy said. "I want to give (campers) reasons to come back and talk me up to their friends and families." Baraboo Hills Campground, Baraboo: Jumping Pillow, inflatable water toys, bicycles, tricycles, new store, blacktop. Cost: $150,000. 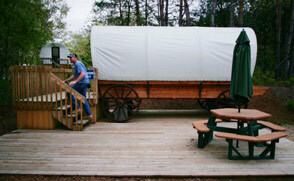 Buffalo Lake Camping Resort, Montello: Two park model cabins, electrical upgrades, camp store improvements. Cost: $150,000 for 2008-09. Deer Creek Campground, Cambria: Enlarging spring-fed swimming pond and adding beach, bridges over small creek for hiking trails. More campsites planned next year. Cost: $30,000. Merry Mac's Campground, Merrimac: Jumping Pillow, water games, inflatable water toys, bath house improvements, chairs and tables, blacktop road paving. Cost: $200,000. Fox Hill RV Park and Campground, Baraboo: New tile for pool, remodeled bath house, nine-hole disc golf course. Cost: $20,000. River Bend RV Resort, Watertown: Jumping Pillow, inflatable water toys, rebuilt pool, new store. Cost: $100,000. Smokey Hollow Campground, Lodi: Jumping Pillow, kids' train, miniature golf course. Cost: $100,000. The Jumping Pillow, a popular addition to area campgrounds this year, offers a bouncing effect similar to a trampoline, but without the hazards. The pillow has no hard surfaces and can accommodate up to 30 jumpers at a time. 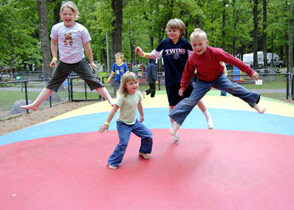 Unlike a trampoline, the effect of one person jumping doesn't affect other users. The first Jumping Pillow was installed in the U.S. in 2005 at a KOA campground near Charlotte, N.C.. About 9,000 have been installed in Europe and 70 in Australia and New Zealand. Prices range from $12,495 to $20,750, depending on size. The Jumping Pillow is distributed in the U.S. by Jumping Pillows, LLC, of Sevierville, Tenn., and Lincoln, Neb. Bud Styer, left, and Keith Stachurski, manager of Smokey Hollow Campground near Lodi, confer at a beach area of the campground. Styer has invested $565,000 this year in improvements at the five campgrounds he operates. 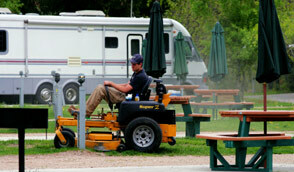 Zachary Zirbel cuts the grass at Smokey Hollow Campground as he prepares the sites for another influx of weekend campers. 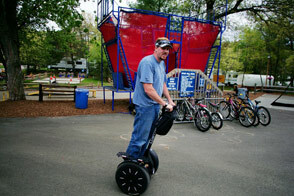 Stachurski patrols Smokey Hollow on a Segway, a small electric vehicle. He also offers riding lessons to campers. The red structure behind him is used for Spaceball, a game that combines the skills of trampoline and basketball. Furnished conastoga wagons and beachfront yurts are among the camping options at Smokey Hollow Campground near Lodi. Children play on a Jumping Pillow at Chetek River Campground near Chetek, north of Eau Claire. 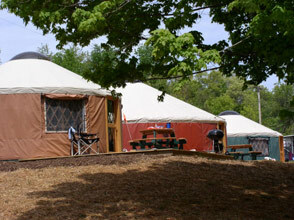 A row of furnished yurts, or circular tents, is another camping option at Merry Mac's Campground in Merrimac.